Q: When is a Tablet Not a Tablet? A: When it has a 6" screen, and IDC is the one doing the counting. Yesterday a bunch of news sites, including this blog, reported that tablet shipments dipped in the 4th quarter of 2014. While IDC reported that tablet shipments were up for the year, they also claimed that 4th quarter shipments dropped by 2 million units. Of particular interest was the detail that Amazon's tablet shipments dropped by almost 70%. Obviously this is a sign that Amazon screwed up, right? Actually, no, you can't reach that conclusion from the IDC "data". When I reported on those stats yesterday I missed one important detail in the press release. Down at the end, IDC mentioned off hand that Amazon's new 6" tablet was not counted this time around but rather was "excluded from our numbers given the small screen size does not match IDC's definition of a tablet". Do they mean to tell us that they arbitrarily excluded one of the more popular new tablet models because the screen was an inch too small? How does that make any sense? Yes, that is what they mean to tell is. I am deeply embarrassed to have missed this detail and had to call BS on my own post, but in my defense I had applied the common sense rule of thumb that since Amazon was marketing this 6" tablet as an alternative 7" tablets and since consumers were buying this 6" tablet as an alternative 7" tablets, they all fell in the same category. IDC sees it a different way, and they are simply wrong. The market gets to decide, not the research firm. And more importantly, their numbers for last year are bunk. Those figures don't reflect the market, so we can't trust them any further than you can throw me. P.S. 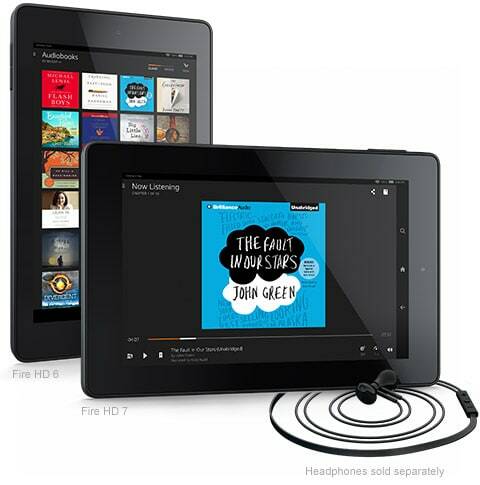 And in case you're wondering, Re/Code says that IDC pegged Fire HD 6 shipments at 1.2 million units. So Amazon's numbers would still be down even if they were included. But at that point Amazon’s drop would be more in line with the size of the overall market drop instead of looking worse than everybody else. Actually, when you add back in that extra 1.2 million units, the market didn’t dip much. And since we know this isn’t the only tablet left out (there are 5″ kids tablet models), we can’t trust the report of a dip at all. Even if you add in these tablets Amazon’s holiday shipments still dropped by some 50% from last year. Now matter how you look at it Amazon is not exactly setting the world on fire hardware wise. Correct. Moreover, this has always been the case. Initially IDC didn’t want to have a general tablet category because they didn’t want their data showing iPads competing with Windows-based tablets, netbooks, or ultrabooks… so they had “media-consumption tablets” — which similarly didn’t count iPod touches. As that definition fell away, they are still isolating small, non-cellular capable devices as “media-consumption devices.” I see nothing wrong with this. And, in either case, the data is not good for Amazon. And if Amazon doesn’t like the data, them they can provide some actual data of their own.